Obsessive Compulsive Disorder (OCD) is an interesting psychiatric condition. Those who suffer from it are most often in touch with the fact that the distorted rationale that compels them to perform rituals in response to anxious thoughts are often very “magical” in nature. What if I stop snapping my fingers? Will the tiger appear? I’m not taking the chance. It’s better to keep snapping and ward off danger. It’s worked so far. I know it’s odd, but I need to keep doing it, just in case. Here’s an example of how we naturally engage in magical thinking when we are younger. Years ago, two children were allowed to stay up and watch the scary movie “Dracula” before bed on Halloween night. Upon retiring for the night, one of the children covered himself with his sheet to precisely under the chin. Although the second child thought this was silly, he decided to position his sheet in the same way – just to be on the safe side. In both the examples of the man at the train station and the young children, similar elements are involved: an attempt to control circumstance by engaging in behaviors that may not make sense to others but reduce anxiety for the person performing them. 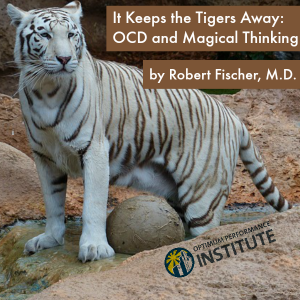 With OCD, even though the rational self can often readily acknowledge that the rituals are strange (which often leads to shame and fear that can delay seeking treatment: “If they knew I had these crazy/scary thoughts they’d lock me away!”), it is possible to convince yourself through powerful magical thinking that the rituals have meaning and are keeping you safe. That’s why you keep doing them. The problem is, the more we engage in rituals to ease our anxious and obsessive thoughts the more these become reinforced. Our beliefs and our own certain way of seeing the world impacts the nervous system and our emotions. If we continue seeing the world as a threatening place, this has a real impact on our internal biology. Neuropathways affecting fear are enhanced. Our world begins to become limited. We begin avoiding people, situations, and places. Other issues can happen in school. Papers don’t get turned in because we haven’t gotten the wording “just right” and need to keep starting all over. We have to re-read passages in text books, which takes a lot of time, often leaving us unprepared because we don’t make it through all of the material for a test. We don’t want people to know that we believe we have to perform a compulsion in order to prevent bad things from happening, so we avoid situations where it won’t be easy to perform the rituals. This can hold us back from important opportunities in life, including at school, work, and in personal relationships. The good news for OCD sufferers is, there is hope! We can redirect neuropathways. We can learn more skillful ways of coping with anxiety, and we can challenge the need to perform compulsions, step-by-step and one moment at a time. With OCD, it is essential to reach the end goal of creating a life worth living. When time is freed up from obsessions and compulsions, a world of opportunity awaits! At Optimum Performance Institute (OPI) we treat the whole person not just the diagnosis, we facilitate dealing with the OCD symptoms by providing opportunities to feel more comfortable socially, to develop one’s passions, and to find joy, express it, and share it. These elements make all the difference in addition to our sophisticated clinical treatment plan, using proven a Cognitive Behavior Therapy (CBT) approach, which seems to be the most beneficial in addition to the skillful use of medication, when appropriate, to help you move beyond the limitations of OCD. If you or a young adult loved one is suffering from OCD, we have a special invitation to extend to you. OPI is planning a free 90-minute webinar on Obsessive Compulsive Disorder in the near future. If you’d like to sign up to be notified of when this webinar will happen, please CLICK HERE. In the meantime, for more information on OPI residential programs and our measures to help reduce Failure to Launch obstacles for young adults with OCD, call us at (888) 814-5985 or click HERE to submit an online form. We’ll be in touch promptly.